This is my second FM after The Green Race 42KM (DNF and you can read my story HERE). First FM running on the road. I am still a novice in running. Why did I sign up for Full Marathon? Because half marathon is no longer challenging enough and I feel I should go for the full distance to better experience how people run and complete a marathon. 2 years ago I said I couldn’t run a 10KM. I would die. But I ran a half marathon at 2XU compression run for the first time. It was painful but I survived, just nearly puked. 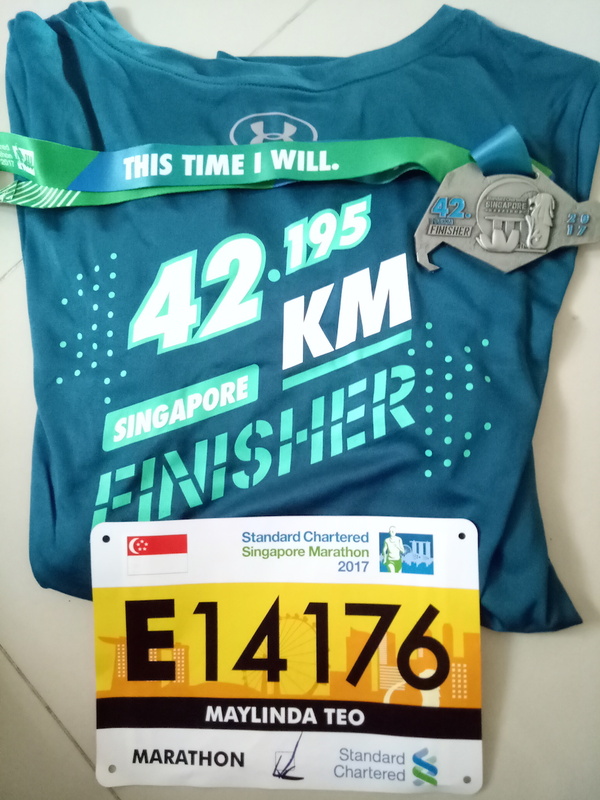 After that first half marathon experience, I was hooked and looking forward to many HM races along the way and I have completed 13 HMs so far and 32KM twice. Shorter races do not appeal to me. I took part in SCSM for the first time this year. As an IAAF Gold Label Race, I was expecting a superb race experience at this prestigious event in Singapore. REPC was good, collecting of race pack was quite fast. I saw the baggage deposit service at the REPC was quite empty. Seems like not many prefer to deposit their bags in advance or they were not aware. To me, I do not bring bag for races and do not need baggage deposit service. I go to races with just a waist pouch storing my essentials like money, ezlink card, credit card just in case, phone and gels. After running, I just go home with stinky clothes. I would suggest to runners not to bring any bags for races for your own convenience and peace of mind. 🙂 To race organiser, for such a big and prestigious event, baggage deposit should have been managed properly but sadly it didn’t happen. I was shocked to see the horrible long queue when looking for toilet in the morning. Portable toilets were not sufficient as well and far away from the flag off pen. 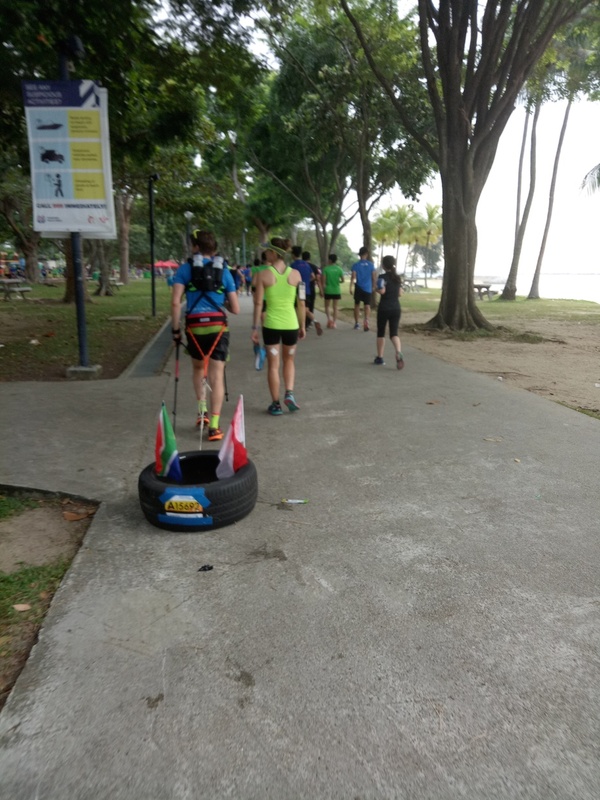 Many runners missed their flag off due to baggage deposit delays and I saw some who chose to carry their bags along to run. It was not a pleasant experience for them. A lady was carrying a large leather handbag on one shoulder with her to run. It was agonising. I was praying for the clouds to shield us from the merciless sun and the clouds really helped. It was mostly cloudy with certain parts being slightly hotter but bearable. I was grateful and pleasantly surprised for the two water mist tunnels that organiser had installed along the route, together with the powerful fans blowing. They were saviours. Some volunteers were sleeping but some were very encouraging and shouting words of encouragement. They were great! Upon reaching 30KM, I was hurting and frowning and couldn’t acknowledge their cheers but I was grateful. Thank you! Happy that hydration points still have enough water and 100 Plus and the 100 Plus were cold! The distance tracked on my Garmin watch went a bit haywire after 10KM and it was clocking about 1KM faster than the marking. But I trust SCSM marking because they were professionally measured. GPS watches can sometimes get interrupted due to many factors. This man was pulling a tire for the marathon distance. I am not sure if he manage to finish. Strong man. A few runners saw me spraying my muscle spray and asked me to lend them and I did. I could empathise their pain because we were all suffering. Along the way, I saw some were vomiting, some collapse on the ground but conscious, they just need some resting. Heard an old runner fainted and was helped into the ambulance. I hope he is fine! 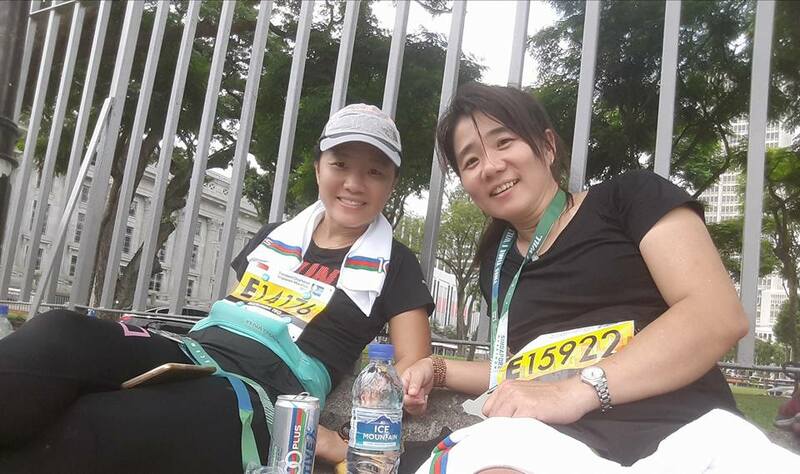 I was walking with my sister for the last 10KM because the legs were simply too painful to run. We just aimed to be able to finish before cut off. So happy to cross the finish line eventually but the distance to collect the finisher tee and medal was quite long. Still couldn’t rest the legs until we collected the items and went to find a place to sit down. Finisher tees were too big for us because smaller sizes were all given out. Organiser should take our sizes upon registration and indicate the sizes on the bibs and we should be ensured of our sizes upon finishing the marathon. This part was very disappointing. Ironman Asia, please fix this issue for your future races as not to tarnish your reputation further. Otherwise, the entire race experience was wonderful. Thank you. Marathon runners are amazing, they have high endurance level and the never say die attitude. 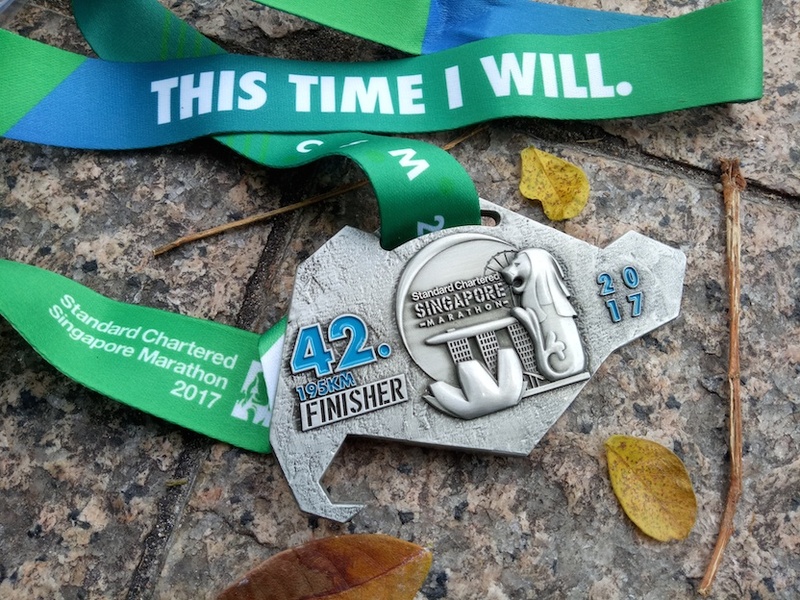 No matter what is your timing, able to finish the brutal marathon is already a huge achievement and you should give yourself a pat on the back! You can now enjoy a feast and eat all you want because you have just burned over 2000 calories! To those who DNF, no worries, train harder and try again! A quote from the late Grete Waitz, “Whether you are a Kenyan trying to break 2:06 or you finish in 6 hours, we respect one another. The 6 hour person for the speed of the Kenyan, and the Kenyan for the tenacity of the 6-hour person. At the end of the day, we are participating in a sport we both love”. Well said. Me and my sister resting after race. Still able to smile means we were fine!